Every story needs a villain, and for The Force Awakens, that’s good ol’ Kylo Ren. A lot of people took issue with the character’s portrayal in the film, but I really enjoyed it, and look forward to seeing more of the character (and the makers of the next Fantastic Four film should take note on how to properly handle a vain, masked, megalomaniac with a bad temper). I’ve only looked at one other Kylo figure, so why not look at another? 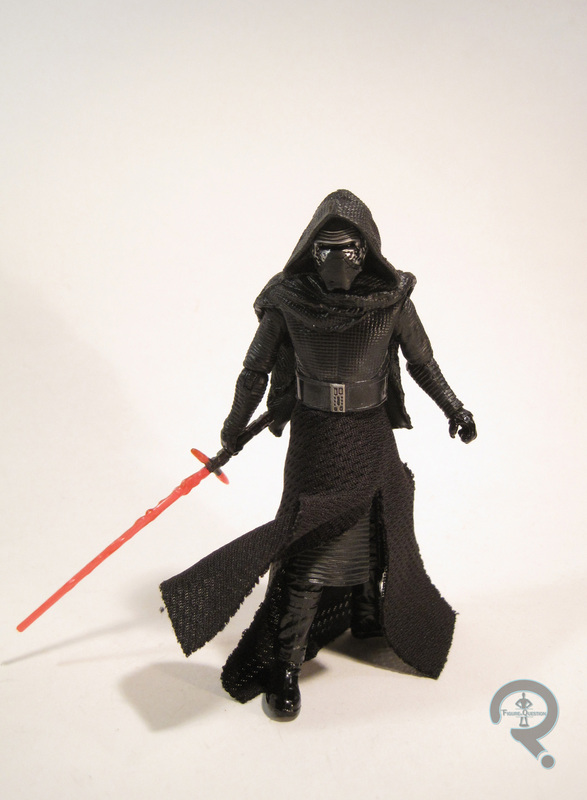 Kylo was released in the second series of the Walmart-exclusive Star Wars: The Black Series figures, alongside yesterday’s Stormtrooper and a figure of Leia from A New Hope. The figure is roughly 4 inches tall and he has 26 points of articulation. The neck and right shoulder are somewhat restricted by the sculpt of the hood, but other than that, the articulation is pretty solid here. 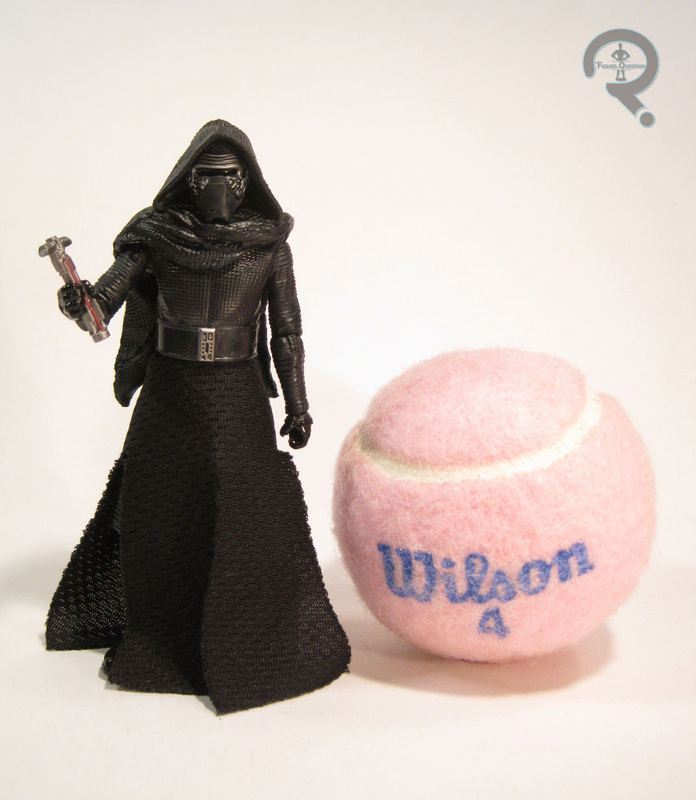 The larger Kylo used cloth for the outer portion of Kylo’s robes, while the regular 3 ¾ inch figure opted to sculpt the whole thing. This figure goes for the best of both worlds. The upper half is entirely sculpted, while the lower half makes use of soft goods for the outer most skirt. This allows for the hood to be a bit more controlled than it was on the larger figure, while still offering some extra movement on the legs. I think this compromise works, though it does look just the slightest bit jarring at the changeover. I wish the cloth skirt were just a touch shorter, but other than that, it works well. The sculpted parts are quite impressive, and offer a ton of really great texture work. On a whole, the figure looks quite imposing, a trait I felt the larger figure lacked. Kylo’s paint is fairly minor, given how much of him is just straight black, but what’s there is pretty solid. The silver of the mask and belt looks good, and I definitely appreciate that they used a different finish of black for the gloves and boots. Kylo is packed with his distinctive lightsaber, both lit and unlit, which seems a better solution than a removable beam. Kylo was picked up at the same time as Finn and the First Order Trooper, purchased for me by my Super Awesome Girlfriend. 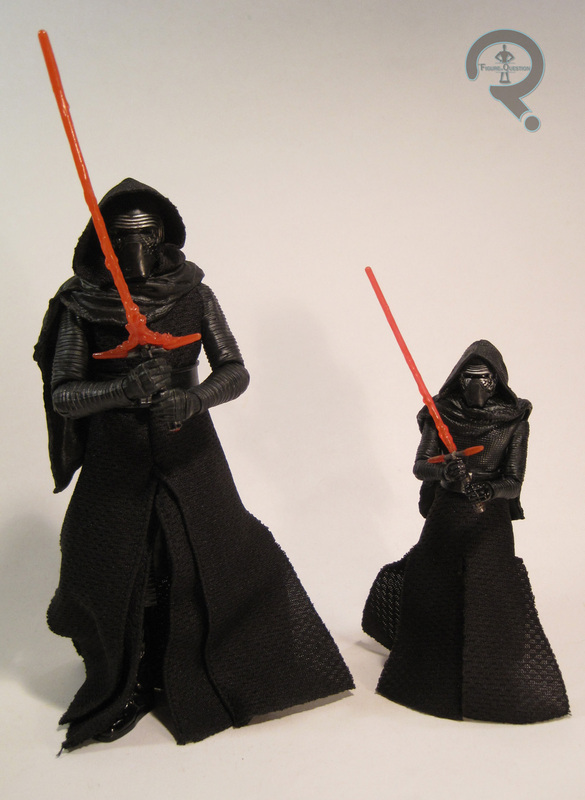 Kylo was definitely one of the figures from this set that I wanted the most, seeing as I didn’t get one of the smaller scale Kylo’s back in September. The 6-inch figure was a bit of a disappointment, but this guy definitely delivered, and he’s probably the best Kylo out there right now.